NOTE - Improved reagents for phosphoprotein synthesis from the Rinehart lab are now available and can be found here. 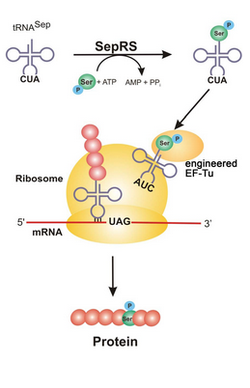 This kit provides an engineered system for specific cotranslational Sep incorporation (directed by UAG) into any desired position in a protein by an Escherichia coli strain that harbors a Sep-accepting transfer RNA (tRNASep), its cognate Sep–tRNA synthetase (SepRS), and an engineered EF-Tu (EF-Sep). Expanding the genetic code of Escherichia coli with phosphoserine. Park HS, Hohn MJ, Umehara T, Guo LT, Osborne EM, Benner J, Noren CJ, Rinehart J, Söll D. Science . 2011 Aug 26;333(6046):1151-4. doi: 10.1126/science.1207203. PubMed. O-Phosphoserine (Sep), the most abundant phosphoamino acid in the eukaryotic phosphoproteome, is not encoded in the genetic code, but synthesized posttranslationally. Here, we present an engineered system for specific cotranslational Sep incorporation (directed by UAG) into any desired position in a protein by an Escherichia coli strain that harbors a Sep-accepting transfer RNA (tRNASep), its cognate Sep–tRNA synthetase (SepRS), and an engineered EF-Tu (EF-Sep). Expanding the genetic code rested on reengineering EF-Tu to relax its quality-control function and permit Sep-tRNASep binding. To test our system, we synthesized the activated form of human mitogen-activated ERK activating kinase 1 (MEK1) with either one or two Sep residues cotranslationally inserted in their canonical positions (Sep218, Sep222). This system has general utility in protein engineering, molecular biology, and disease research. Improved reagents for phosphoprotein synthesis from the Rinehart lab are now available and can be found here. "The plasmid kit used in this publication was a gift from Jesse Rinehart and Dieter Söll (Addgene kit # 1000000020)"